High Quality Content by WIKIPEDIA articles! Steven Patrick Morrissey born 22 May 1959, known primarily as Morrissey, is an English singer and songwriter. He rose to prominence in the 1980s as the lyricist and vocalist of the alternative rock band The Smiths. After the band's breakup in 1987, Morrissey began a solo career, making the top ten of the UK Singles Chart in the United Kingdom on ten occasions. Widely regarded as an important innovator in indie music, Morrissey has been described by music magazine NME as "one of the most influential artists ever, and The Independent has stated that "most pop stars have to be dead before they reach the iconic status that he has reached in his lifetime. Pitchfork Media has called him "one of the most singular figures in Western popular culture from the last 20 years. 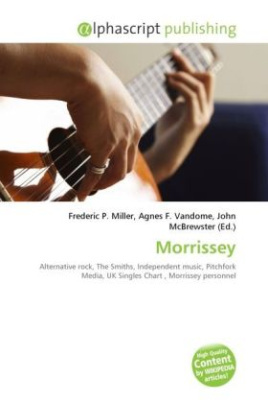 Morrissey's lyrics have been described as "dramatic...bleak, funny vignettes about doomed relationships, lonely nightclubs, the burden of the past and the prison of the home. He is also noted for his unique vocal style.